I am touched and very happy to be able to celebrate with all of you this anniversary, which is very important for our company. What we see today, is the confirmation of a simple and obvious fact: when so many talented people work together with the same vision, results can be surprising. What we have in front of us is the result of the work of a team of people. In 40 years Dallan developed from being a small technical office to a company of over 150 employees, with a 32M Euro turnover, over 450 active customers and over 3000 machines already installed worldwide. The past year brought important results, both from the point of view of productivity and development of new technologies, and in terms of new orders for 2018. We are, in fact, already taking new orders for 2019. This is the result of the efforts of all our team, as well as of Dallan agents and historical suppliers, who stood by us and have grown together with us. 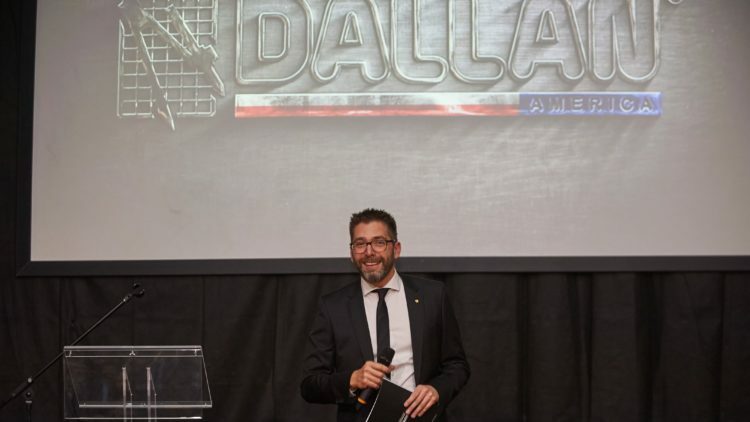 In this past year, we achieved very good results especially in Europe, north Africa, up to Argentina and Australia: Dallan, in fact, works directly in over 80 countries and we are engaged today to consolidate our presence in our historical markets, open new ones and strengthen our relations with existing customers. Dallan is working to stay focused on the production of rollforming machines and specialized automatic production systems. In particular, machines for plaster board profiles and ceilings and for rolling shutter and venetian blind aluminium profiles with the Dallan Coil-To-Window system. In these branches, we are recognized as the world leading supplier of manufacturing systems and we are supplying to main producers in the market. To maintain this position, continuous investments are necessary, as well as continuous efforts and innovation. Besides our historical fields of application, over the last years, we have added to our range also the laser cutting systems, a market that is growing globally. For this reason, our laser and punching department invested a lot over the past 5 years, and these are the type of machines for which the request has been growing more in Europe and North America. On the 23rd of February we have opened our first branch in the United States: Dallan America Corp. will be in charge of developing this huge market, where we have been present with our machines for over 20 years already. Initially, it will simply operate a sales office, but we are going to implement also the technical service and spare parts service. The technologies that we will develop, will be even leaner, more flexible and sustainable. Dallan systems working from coils, already allow to produce more using less raw material compared to systems working from the sheet. This is an important economic advantage for our customers and, at the same time, it is a sign of respect towards our natural resources. Moreover, we are developing technologies even more clean and with low energy consumptions, like laser cutting and servo-electric punching. These are ambitious programs, for which we need time, a shared vision and determination. And they are for sure within our reach, knowing the energy and skills of this team. Industry 4.0 is also stimulating the internal market, requiring even larger contribution from our software department. We have noticed that, thanks to the way our machines are designed and long-term outlook of our technicians and engineers – together with the requests coming from our customers, Dallan systems already incorporate all fundamental concepts of Industry 4.0 for over 5 years. Therefore: listening to our customers, building strong partnership with them and delivering effective solutions to their problems is the key to develop innovative products that create value. To do this, we do need the Human Touch. I think that in the field of machine manufacturers, complexity, which is also the beauty of our job in Dallan, requires high levels of interaction between people, so between us and our customers, inside our team, with our suppliers and with our community. As our customers say, the human touch is one of the distinguishing features of Dallan, so we do want to enhance it and invest even more in talented people, by recognising once again the importance of the contribution each of our team member gave to results we achieved today and to be able to face future challenges and projects right away.